U.S. Route 51 and the I-55 freeway traverse the city from north to south, and the I-69 freeway crosses the city from east to west. Hernando's historic downtown square, which surrounds the county courthouse, is located at the intersection of Commerce Street and what is now U.S. 51. Hernando is in the center of DeSoto County, bordered to the north by the city of Southaven. 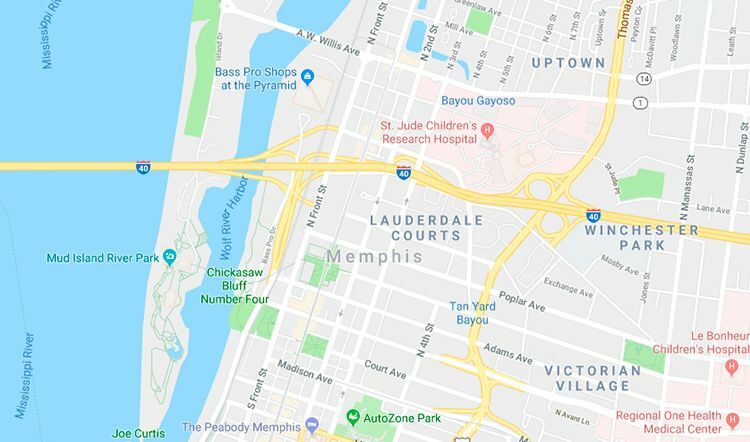 Via Interstate 55 or US 51, it is 25 miles (40 km) north to the center of Memphis, Tennessee, and south 15 miles (24 km) to Senatobia. According to the United States Census Bureau, the city of Hernando has a total area of 25.8 square miles (66.9 km²), of which 25.7 square miles (66.6 km²) is land, and 0.1 square miles (0.3 km²), or 0.39%, is water. As of the census of 2000, there were 6,812 people, 2,482 households, and 1,809 families residing in the city. The population density was 603.0 people per square mile (232.8/km²). There were 2,720 housing units at an average density of 240.8 per square mile (92.9/km²). The racial makeup of the city was 76.35% White, 21.48% African American, 0.15% Native American, 0.66% Asian, 0.78% from other races, and 0.59% from two or more races. Hispanic or Latino of any race were 3.04% of the population. There were 2,482 households out of which 35.5% had children under the age of 18 living with them, 55.2% were married couples living together, 13.4% had a female householder with no husband present, and 27.1% were non-families. 22.9% of all households were made up of individuals and 8.5% had someone living alone who was 65 years of age or older. The average household size was 2.60 and the average family size was 3.05.